Guarantees and warranties are a key part of any roofing and waterproofing system and like most roofing guarantees or warranties, the devil is in the small print detail of the paperwork itself. Most people are unaware of the specifics of any such guarantee / warranty or its shortfalls exposing themselves to liabilities that are assumed to be covered. There are 4 major aspects to any roof or waterproofing system warranty or guarantee? Quality of Workmanship & Installation. Recorded Maintenance & Service Plan of the System. In most cases the small print in the paperwork needs to be carefully read and understood, since the risk is that when the guarantee or warranty is required, at a point of a claim, you may find holes in the guarantee between the manufacturer and the “approved” contractor that could invalidate any such claim, leaving you holding the bill. In most cases without recorded maintenance or a roof / waterproofing service plan of the installed product the material guarantee is invalidated against any claim. Click on the links to discover the differences between the two type of warranties available in the marketplace and your liabilities as a building owner or developer. What is the Traditional Roof Guarantee in the market place? Long-term Product / Material Guarantees on the main roof system items, up to 20 years. 1 or 2 Year Workmanship Warranty. In many cases when looking carefully at the product or material guarantee, you will find that the guarantee is simply stating that IF maintained, the suppliers will guarantee that the material will not become perforated through corrosion, with no specific comment regarding the all important perimeter or junction details or flashings. Important Note: If the roof system is not official recorded as being regularly maintained, then the material suppliers of the metal roofing or waterproofing systems, state clearly that there guarantees are invalidated. Any roof or cladding system is only as good as its design, perimeter detailing, installation & maintenance. The mostly likely cause of a roof leaking or complete failure is poor quality installation, omission of essential elements or inadequate perimeter design. Important Note regarding Perimeter Detail: In most cases the perimeter flashings shown in manufacturers technical guides, show the principle of how the detail should be constructed, the size of the flashing details needs to be determined by project location, roof pitch and the specified roof system. In many cases the size or girth of the flashing is determined by the contractor based on commercial reasons rather than technical i.e. how many flashings can be manufactured out of one flat sheet, thereby saving money. Please check our guide on how to construct perimeter details correctly. 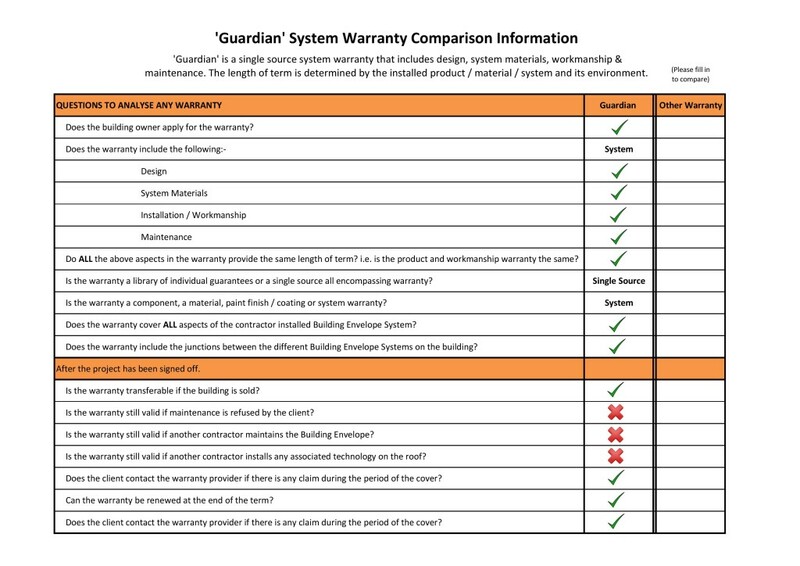 Why is the ‘Guardian’ System Warranty different? The Guardian System warranty cover all three aspects for a guarantee or warranty to be a worthwhile investment for the building owner or developer. Up to 20 year system warrantee including materials, workmanship, maintenance and a roofing service plan. Cover is on all installed systems by MRC Group – Metal Roofing & Cladding, Green Roof Systems, Waterproofing, Protective Coatings & Fire Walls. Includes all parts of the system, junction points between different system and all perimeter details and flashings. Every ‘Guardian’ System Warranty is supplied with a scheduled roofing maintenance and service plan to be undertaken by MRC Group, which is in place for up to 20 years. THE TIME MOST PEOPLE FIND OUT ABOUT GUARANTEES ARE ……. IS …….. WHEN ITS TOO LATE! MRC Group’s single source building envelope system guarantee for up to 20 years from design, workmanship & maintenance provides ‘peace of mind’ on your investment.